Hollins, David. 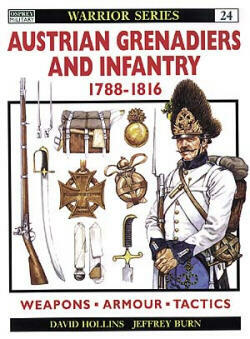 Austrian Grenadiers and Infantry, 1788-1816. ("Warrior" Series, no. 24). Illustrations by Jeffrey Burn.� Oxford, UK: Osprey, 1998. 64 pages.� ISBN# 1855327422. Softcover. $16.95. Despite its importance, the Austrian army remains a relatively neglected subject of the Napoleonic Wars. With numerous new works being published on the French army, there are only few works dealing with the Austrian infantry engaged in the wars against the revolutionary France.� In Austrian Grenadiers and Infantry, David Hollins had written an interesting and useful introduction to Austrian troops of the Napoleonic Wars. Based on his research in Austrians archives, this booklet provides informative insight on the topic. The author has organized the book into short chapters covering various aspects of army life. "The Raw Material" describes potential recruits, recruitment requirements, drafting ceremony and difficulties related to it. The next chapter "Training" concentrates on drilling of soldiers and covers the various regulations adopted by Austrians during this period, including the 1769 and the 1806-1807 Regulations. The chapter on leadership covers Austrian officer corps leading infantry and grenadier regiments. Hollins provides interesting details on organization of each regiment, background and training of officers. "On campaign" describes life of an Austrian infantryman during the numerous campaigns the Austrians fought between 1788 and 1815. Hollins explains the regimental supply system and proceeds to portray the soldiers' life on campaign in 1805, 1809 and 1812. Although relatively brief, the chapter on tactics has enough information to introduce a reader to Austrian tactical maneuvers. Throughout the book, the author uses various primary sources, memoirs and reports to enliven the narrative. His chapter "Into Battle" is the best example of this and author does a superb job describing the Austrian fighting style, concentrating on Battle of Wagram of 6 July 1809. One of the greatest assets of this book lays in numerous black and white illustrations that animate the entire book and help the reader to imagine himself in the period discussed. Various tables and charts are also inserted throughout book and provide interesting data on Austrian pay and bread portions, measures, soldier's paces as well as infantry maneuvers and deployment. Finally, Jeffrey Burn's twelve color plates are excellent for their quality and details. The bibliography at the end of book details sources considered for this book, as well as information on where to find additional material on the topic. In conclusion, David Hollins contributed another useful booklet to the Osprey Series. It is a well-documented and informative view on Austrian army and any student of the Revolutionary and Napoleonic Wars will find it engaging and illuminating.